The field of philanthropic studies is growing. According to a recent estimate by David Horton Smith, taking a broad perspective of ‘altruistics’, about 8,000 researchers are active. In ‘A Brief History of Research on Philanthropy‘, one of the products of the literature review that forms the core of this website, the growth of research on philanthropy and its dispersion over academic disciplines is described. Here is a key figure from that paper. 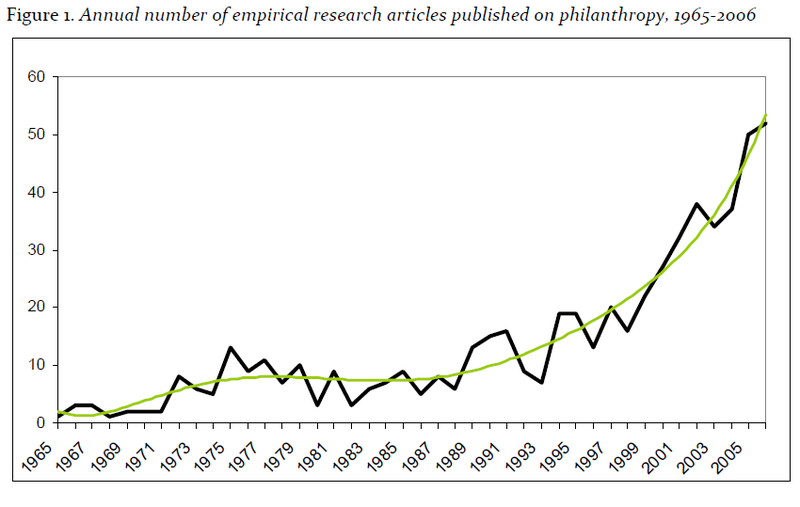 Also the prevalence of ‘philanthropy’ in Google Books is increasing again since 1984. The term ‘charitable giving’, though less prevalent than philanthropy, shows a steady increase since 1974. Researchers across disciplines base new studies on philanthropy on existing knowledge. A special issue of the International Journal of Nonprofit and Voluntary Sector Marketing shows how. You can download the introduction here. There are strong differences in the level and nature of philanthropy between individuals. Which characteristics of people are typical of generous donors? We’ve answered this question in two articles in Voluntary Sector Review. Part I deals with Religion, Education, Age, and Socialization. Part II deals with Gender, Family Composition, and Income. If you do not get access to the publications through the links above, click here for Part I – and here for Part II. People may have very different reasons to engage in philanthropy. What do we know about the academic literature about philanthropy? We answer this question in an article in Nonprofit & Voluntary Sector Quarterly. Click here if you do not get access to the article through the link above.